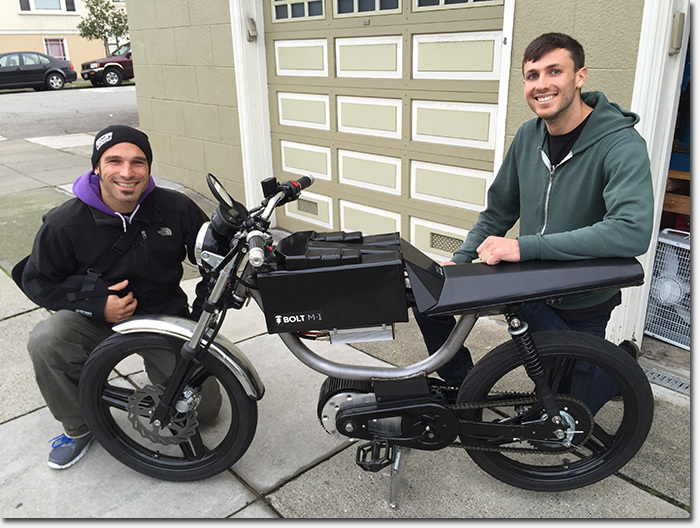 Bolt is a San Francisco-based startup that makes electric motorbikes. The bikes are handmade in a small garage out in the Richmond District, and come with the same type of lithium-ion batteries used in Teslas. Co-founder Nathan Jauvtis grew up riding and assembling motorcycles and bikes, but he really liked the idea of building his own bike – one that would be clean and easy to ride. He started Bolt out of his garage not too long ago. The Bolt M-1 is the first Bolt bike off the line. The bike is keyless and can start with a unique passcode or from your smartphone. The Bolt app will locate your vehicle, should anything happen to it. What is also neat is that the bike also comes with a USB port for plugging in your smartphone while on the go. The bike has two settings: Eco mode with a top speed of 20MPH pushing 1,000 watts with a 50-mile range and Sport mode with a top speed of 40MPH with a 30-mile range pushing 5,500 watts. Bolt is technically categorized as a bicycle, and you can ride it in the bike lane or lock it up on a bike rack. You also won’t need a motor vehicle license to ride it in the city. Another cool feature is that you can charge your bike batteries by pedaling. According to the Bolt website FAQ, it takes about 90 minutes for a plugged in charge. 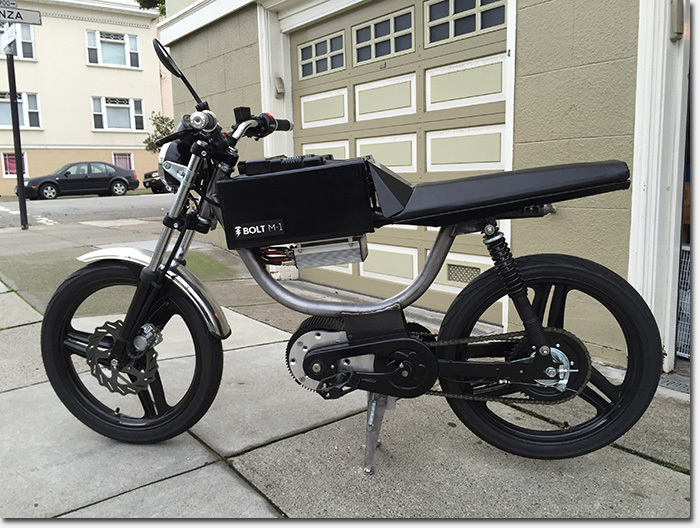 Bolt is currently accepting $500 deposits to be part of the initial production of the bike. The deposit will secure potential buyers a spot in the crowdfunding campaign it will launch in September. The first bikes will cost $4,995 with normal pricing landing somewhere between $5,500 and $6,000. It’s not cheap. The first generation of any product rarely is. In the meantime, the Bolt team is hand building 10 bikes for beta testers out of a garage and a living room in San Francisco’s Richmond district.